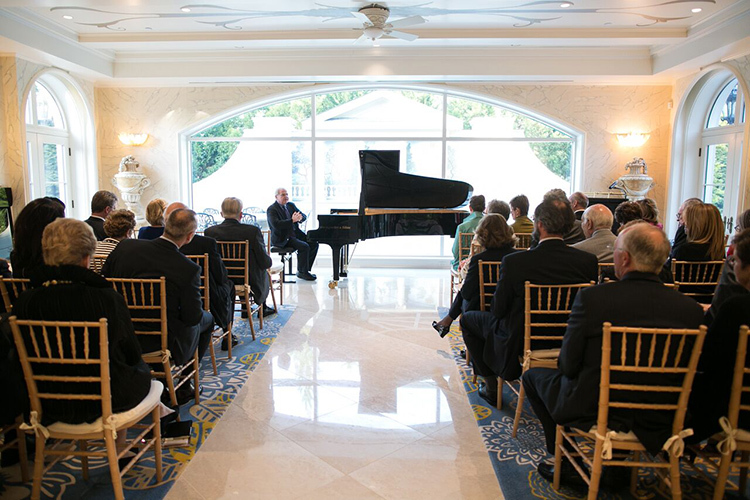 Sunday Concerts, the Phillips’s time honored music series, began in 1941. Before then music had always been a part of life at the museum, but the formal inauguration of the series aimed to bring the same level of ambition and experimentation that Duncan Phillips had for the visual arts, to music. The charge was led by the inimitable Elmira Bier, Duncan Phillips’s secretary from 1924 onwards. Phillips could scarcely have found a stronger advocate in Bier, who although not formally trained in music, schooled herself out of necessity across a broad range of artistic areas. Her lack of musical preconceptions may have been her strongest suit, as it led her to take risks, especially in her encouragement of young artists. This remains a central tenet of the concert series today as we carry the torch into the current 73rd season and beyond. 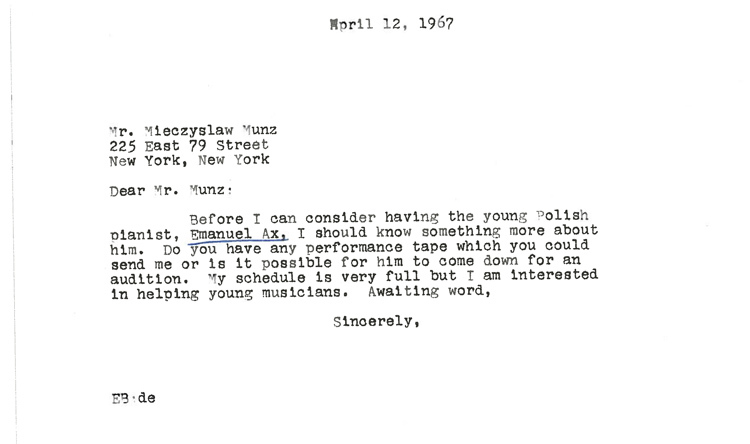 Letter from Elmira Bier to Mieczylaw Munz, September 8, 1967. The Phillips Collection Archives, Washington D.C.
Emanuel Ax to Elmira Bier, undated. The Phillips Collection Archives, Washington D.C.
One can imagine Elmira and her staff huddling around an early compact cassette player listening to Ax’s DIY recording. We do not know what he recorded, but clearly it was enough to make an impression on the discerning music director, who wrote back in May of that year offering Ax a Sunday afternoon performance. 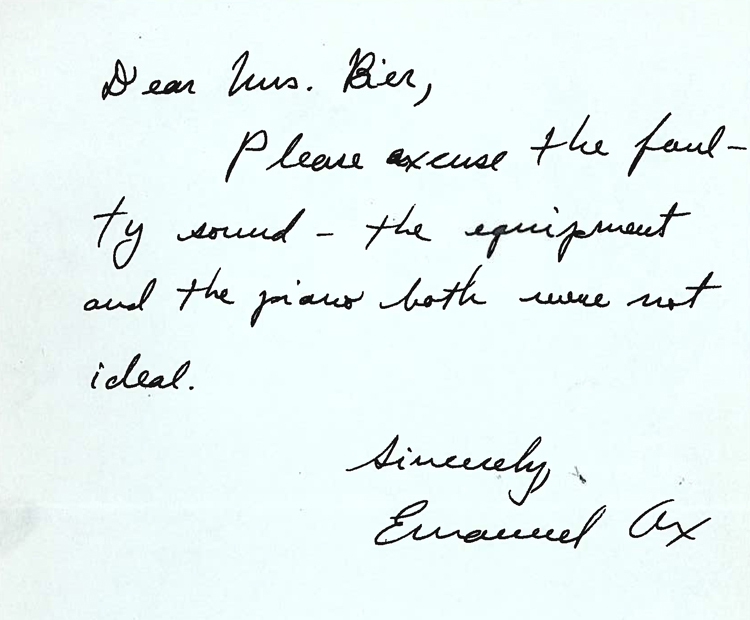 Elmira Bier to Emanuel Ax, May 18, 1967. The Phillips Collection Archives, Washington D.C. Ax wrote back soon after with his ambitious program: two Scarlatti sonatas; the Sonata, Op. 57, Appasionata, by Beethoven; two Liszt transcriptions of songs by Schubert; the Intermezzo in E Major, Op. 116 by Brahms; L’isle Joyeuse by Debussy; and Chopin’s Etude, Op. 10, No. 8 and Ballade in G minor, Op. 23. It was certainly a brave and auspicious choice of works, and shows a musical maturity that belied his young age. He was still a student cutting his teeth on the circuit when he performed at the Phillips, and it is a mystery what the audience would have thought about this young man, who in just 7 years’ time would go on to win the first ever Arthur Rubinstein competition in 1975, catapulting him to international stardom. If they were anything like Elmira Bier, they would have welcomed his ambition and passion for music-making with open arms. There was one last piece of motherly advice that the worldly wise Elmira had for the young aspiring concert pianist, advice that we are sure did not go unnoticed. 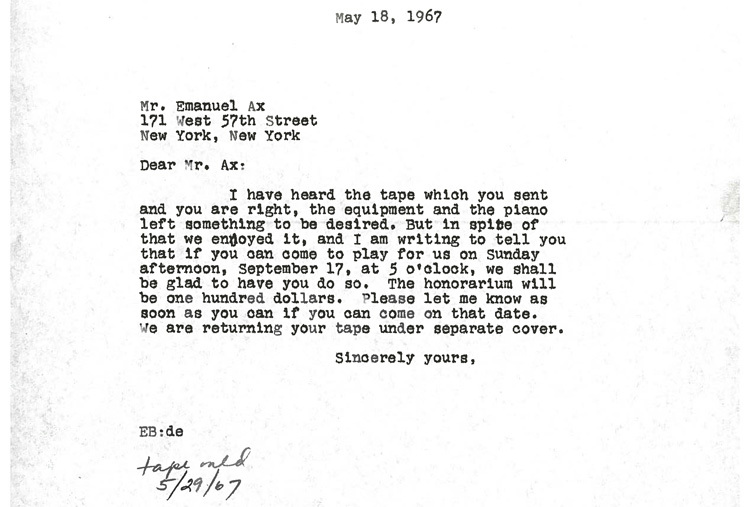 Elmira Bier to Emanuel Ax, September 8, 1967. The Phillips Collection Archives, Washington D.C.